Seems like my current obsession for crayon-like lip products like Revlon's Balm Stain goes deeper than I thought, because I was instantly drawn to the display of Annabelle TwistUp Lipstick Crayons at Shoppers. They have a lot more than shape in common, as both allow you to twist the bottom to push up more product,(rather than having to dig out your sharpener) and seem very moisturizing. 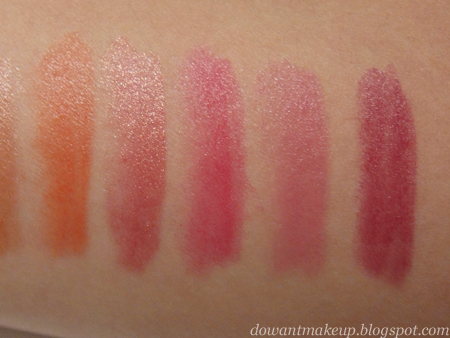 I wouldn't be surprised if there are very close dupes between the two shade-wise as well. 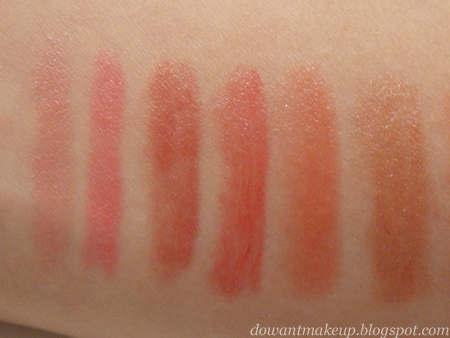 TwistUps are available in 12 shades in total (I'm missing dark pink Flirtini) that seem fairly pigmented and glided on my arm very smooth and creamy, most likely with the help of shea butter in the formula. Tease and Fizz are the only two that are frosty. Although I have more than enough lip products to last me for years, it's hard to resist the combination of colour and hydration that these crayons offer. I will probably end up buying a shade or two and compare against the Revlon Kissable Balm Stains, of course in the name of science. All for science, honest.